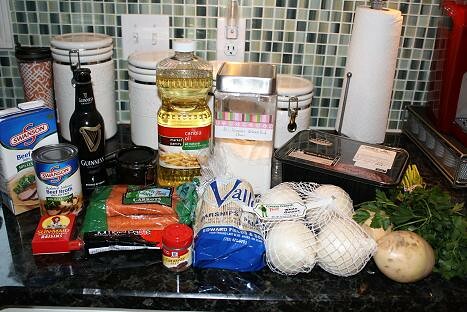 To make this lovely stew you will need the following items: Beef Broth (I went for fat free and low sodium broth), Bottle of Guinness, Salt, Canola Oil, Flour, 2 Pounds of Chuck Roast, Fresh Parsley, Turnips, White Onions, Parsnips, Carrots, Caraway Seeds, Tomato Paste, and Raisins. 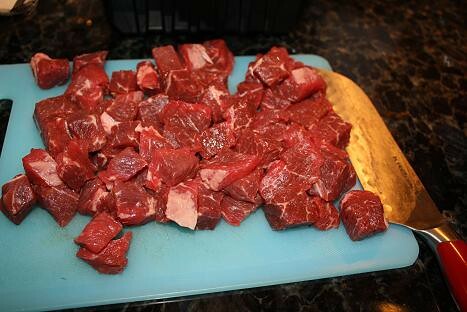 Begin by cubing your Chuck roast into about 1-inch cubes. I ended up cutting the roast in half and working with it in two parts. Sprinkle about 1/2 teaspoon of salt over the beef. Get a shallow pan and put about 1/4 cup of flour. 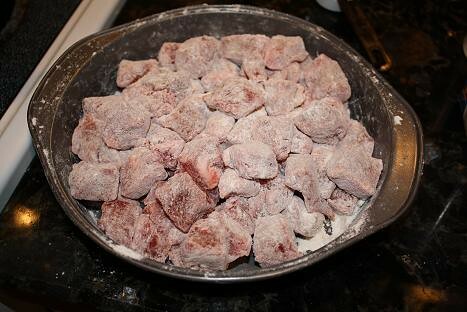 Put the first half of cubed beef in the pan and make sure the beef is lightly coated with flour. Since I cooked the beef in two batches, I began by putting 1 1/2 tablespoons of canola oil in a Dutch Oven under medium-high heat. 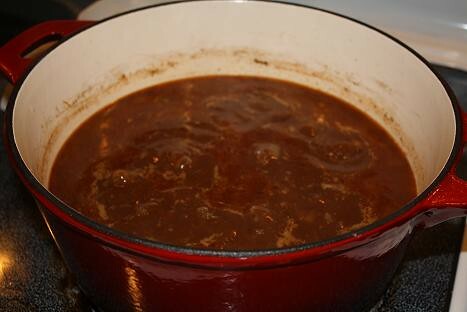 Cook the first batch of beef for about 5 minutes, stirring often, until the meet is brown on all sides. Then remove the beef from the pan and repeat this process with the second half of meat until all of the beef is cooked and has been removed from the pot. 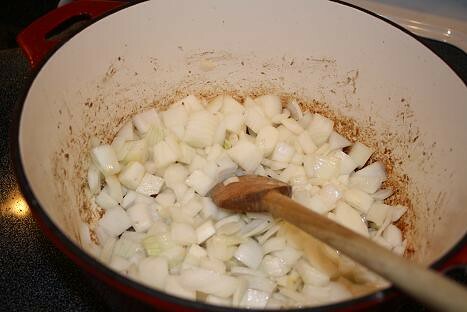 Once the beef has been removed from the Dutch Oven, add three onions chopped up (approximately 5 cups) to the pot and begin cooking in the pan for about 5 minutes or until they are tender. 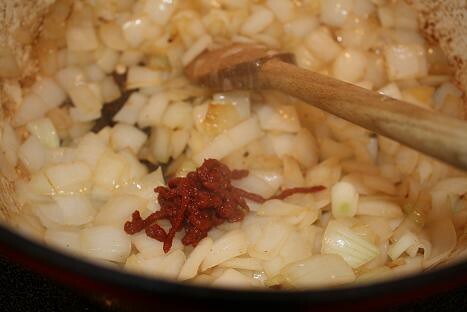 Add one tablespoon of tomato paste the onions and stir it up with the onions for about a minute or so. 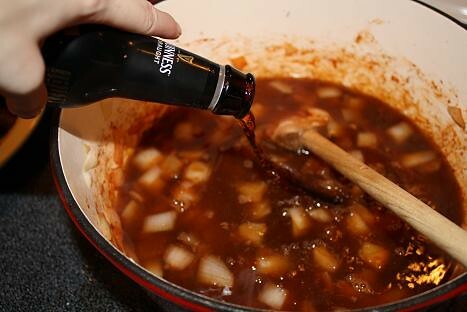 …then finally add one bottle of Guinness stout. 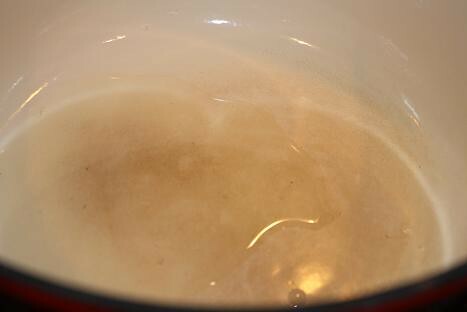 Stir everything up and scrape up the brown bits from the bottom of the pan as you stir. 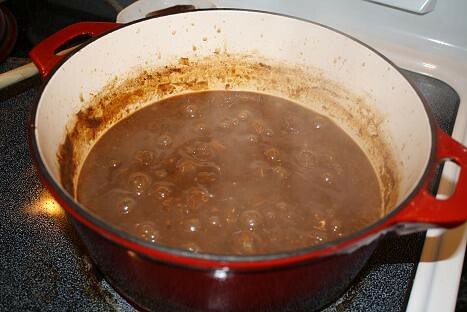 Add the beef back to the pot and then add your raisins, caraway seeds, and black pepper to the stew and stir it up. 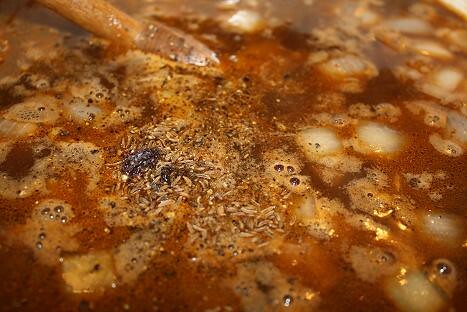 Once everything is combined, bring the stew to a boil. 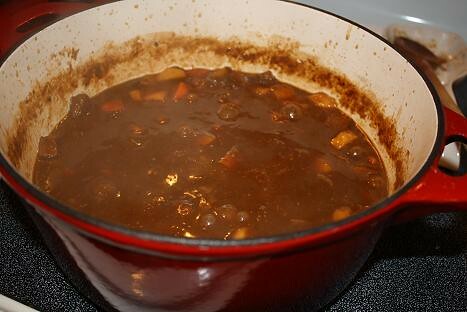 Put on the lid, reduce the heat and simmer the stew for about an hour. Be sure to stir the stew occasionally. 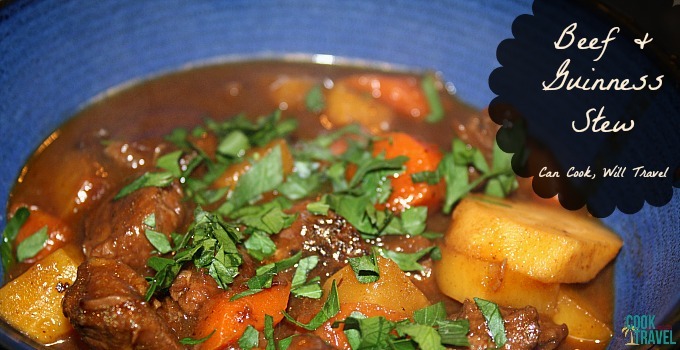 …and continue cooking the stew this way for another 50 minutes. 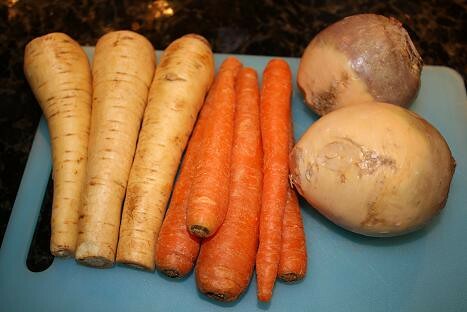 During this cooking period, I got out the root veggies I would need. I used approximately 8 ounces of carrots, 8 ounces of parsnips, and then I had two turnips and thought I’d use them both since I adore that veggie. 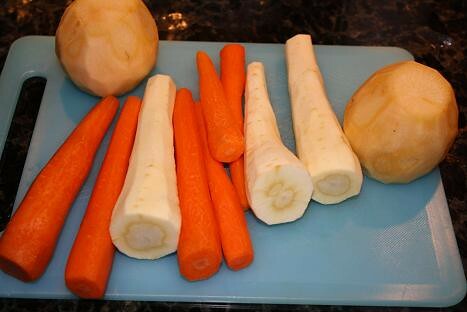 Go ahead and peel all of the veggies and cut off the ends. I just used a vegetable peeler for all of the vegetables, and it worked like a (lucky) charm..sorry I couldn’t resist! Cut all of the veggies to 1/2 inch sizes so they cook evenly. 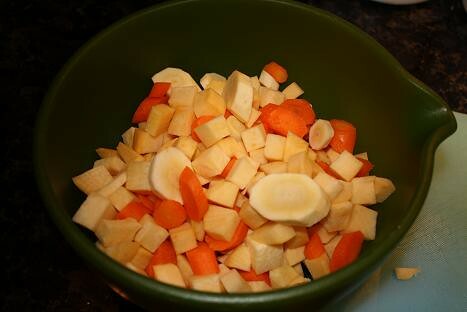 I cubed the turnips and just sliced the parsnips and carrots. …so go ahead and toss in the vegetables and stir them around. 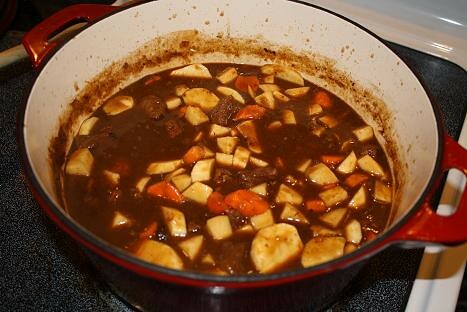 Cover the dish, reduce the heat, and simmer the stew for about 30 minutes and stir occasionally. 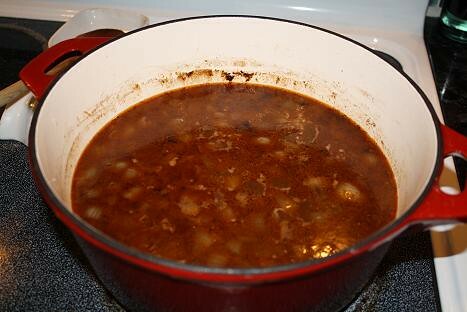 Then remove the lid and cook the stew uncovered for another 10 minutes. Test to make sure the vegetables are tender and then you are all done. 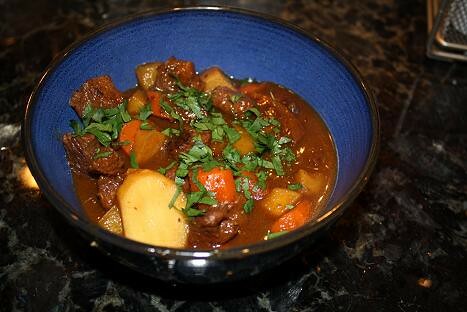 Spoon up some stew and serve with some chopped parsley…wow, it’s such a hearty, tasty stew…dig in! 1. Heat 1 1/2 tablespoons oil in a Dutch oven over medium-high heat. 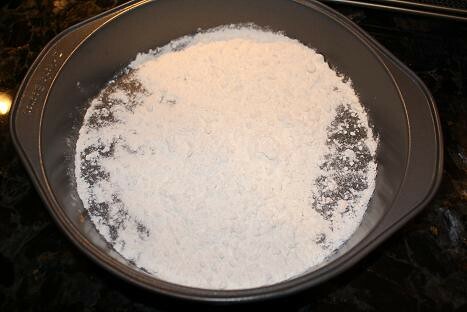 Place flour in a shallow dish. 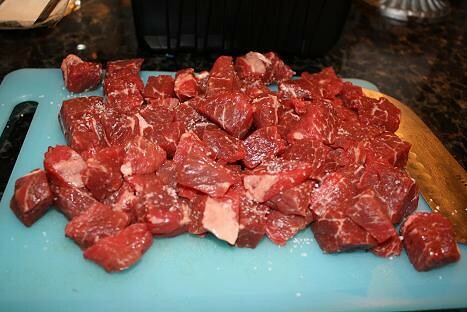 Sprinkle beef with 1/2 teaspoon salt; dredge beef in flour. 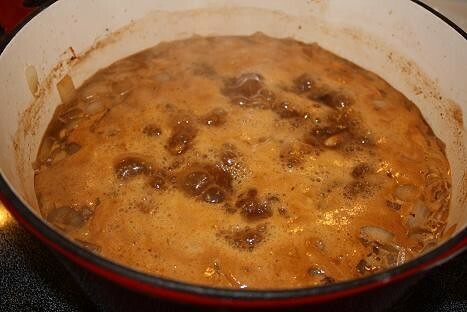 Add half of beef to pan; cook 5 minutes, turning to brown on all sides. 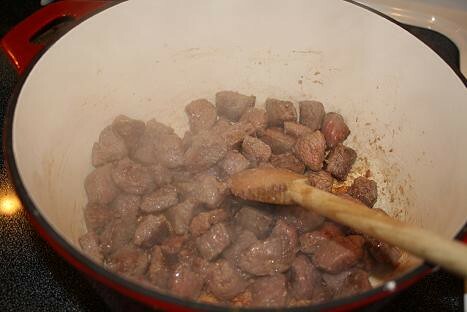 Remove beef from pan with a slotted spoon. 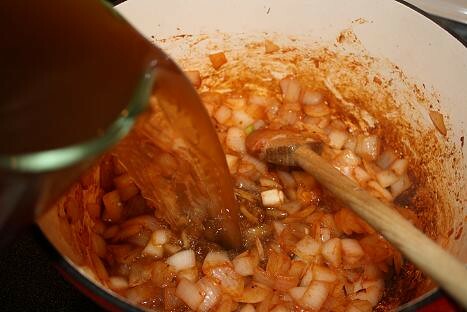 Repeat procedure with remaining 1 1/2 tablespoons oil and beef. Previous Post: « Happy St. Patrick’s Day! Bring on the Guinness!